CNN Geek Out: Tell us little about your self. Enrique Bertran (NewbieDM): Well, I'm a 30-something husband and dad in Miami, who's a network sports TV producer by day, and a pretty big nerd at night. I'm into all the stereotypical geeky stuff, "Star Wars," video games, superheroes, etc ... My wife calls me a man-child, and there's some truth to that. Geek Out: One of your creations is a tabletop role-playing games for kids called RPG Kids. Can you tell us how that came about? NewbieDM: I host D&D gaming sessions at my house with a group of guys I've been gaming with on and off for close to 20 years, and my daughter, who was four at the time, took an interest in the game and its funny dice. So rpgKids was my way of introducing her to fantasy role playing games in a simple manner. I created some kid-friendly rules, put it up on my blog, and it kind of took off from there. Geek Out: Was RPGKids your first try at designing a game system? NewbieDM: Oh yeah, I'm not a game designer, I'm a TV producer, that's my first passion. Game design was something I stumbled on out of necessity. Geek Out: How has the feedback to the game been? NewbieDM: The feedback has been fantastic! I can't tell you how happy it's made me to hear about all these parents discovering the game and having fun with their kids. For a lot of parents it's surprising how quickly the kids learn and begin to role play. It's something that most kids do in playtime anyway, without the dice. Geek Out: Do you think it is a good thing for kids to play RPGs? I think it fosters creativity, teaches them basic math skills and it's fun! What's the negative? Some might say that there's a bit of violence in those games, but really it's all about how you present it. In rpgKids for example, monsters get hurt or knocked out. Nobody ever dies, and there's always an ample supply of medicine waiting in a treasure chest. Geek Out: At what age do you think you should start getting your children into RPGs? NewbieDM: Most gamers my age (I assume) started playing at about the same time, when they were kids and video games weren't as prevalent as they are today. I got my first boxed set at 12, back in 1985, for example. I guess it's all about what you are presenting the kids. Call of Chthulu for a little one? Probably not. Save Trixie the Unicorn from the mean goblins and celebrate with a picnic? Yeah,sure! Geek Out: How does having them play a tabletop RPG different from playing one that is a video game? NewbieDM: Well, rpg's are more imagination driven, more social, and again, I can't say enough about the math and reading progress my daughter made as we played together. Video games are mostly about sitting on the couch mashing buttons, and that's not something I want my kids doing yet. Geek Out: Any other RPGs on the market that you think work well with kids? NewbieDM: There are quite a bit. Games like "Happy Birthday, Robot" by a game designer named Daniel Solis and "Mouse Guard" by Luke Crane come to mind. The latter isn't exactly aimed at children, but it is set in a world populated by mice and can be presented in a way fit for kids. Geek Out: In your play testing have you seen any down side of kids playing? NewbieDM: Yeah, that she wants to play ALL THE TIME! Honestly, I haven't seen any negatives, and as a responsible dad, if I felt that our games were having any negative impact on her, I'd curb it. The one negative my wife might bring up is that I'm raising a nerd! But that's fine by me. Better a nerd than a bully. Geek Out: Has anyone ever asked you if you where overtly proliferating nerd culture by creating what could be seen as D&D for kids? NewbieDM: My wife isn't into really geeky stuff like D&D, so she let's me handle that stuff when it comes to the kids. I'm still not sure if she was happy or upset that my daughter dressed up as Darth Vader for her preschool Halloween. I'll take the blame for that. Geek Out: Any plans to release expansions to RPGKids? NewbieDM: I am actually days from releasing the first adventure pack for the game. It includes four adventures, and includes pirates, dinosaurs, unicorns and mean evil wizards. Keep checking http://www.rpgkids.com for that! Geek Out: What RPGs do you play? NewbieDM: I currently play D&D, "Dragon Age" (a dice based version of the video game), and "Star Wars." Geek Out: How long have you played? NewbieDM: Wow. Over 20 years, and mostly with the same crowd. Although now I'm doing some gaming online via Skype and virtual tabletops. Technology is wonderful. Geek Out: Rebel or Empire? NewbieDM: None. A smuggler in my own Millennium Falcon. I may become a rebel, but the money better be worth it. Geek Out: Any last thoughts? NewbieDM: Yes, whether you do it via rpgKids or some other way, take the time to share your gaming hobby with your kids. You'll be surprised at the results. Kids make great role players and storytellers too. At the end of the day, if the gaming doesn't work out and all you get out of it is an hour laughing and coming up with silly stories, it makes it worth it anyway. Geek Out: Where can folks find you? NewbieDM: I run a blog for D&D Dungeon mastering called NewbieDM, and that's at www.NewbieDM.com. 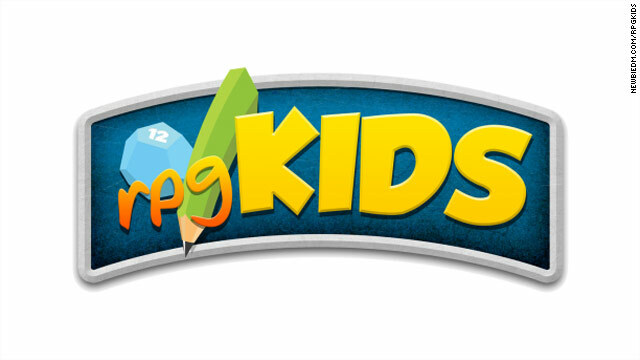 RpgKids is found there, or at rpgKids.com or on Twitter @NewbieDM. Hi there, simply become alert to your blog through Google, and located that it is really informative. I am gonna watch out for brussels. I'll be grateful if you happen to proceed this in future. A lot of other folks shall be benefited from your writing. Cheers! You're in point of fact a just right webmaster. The website loading velocity is incredible. It kind of feels that you are doing any distinctive trick. Furthermore, The contents are masterpiece. you've performed a magnificent job on this topic! Useful information. Fortunate me I discovered your website unintentionally, and I am shocked why this coincidence didn't happened earlier! I bookmarked it. A person necessarily assist to make significantly posts I would state. This is the first time I frequented your web page and to this point? I surprised with the analysis you made to make this particular post extraordinary. Fantastic task! Remarkable things here. I'm very satisfied to look your post. Thank you so much and I'm taking a look ahead to contact you. Will you kindly drop me a mail? Hello, i think that i noticed you visited my blog thus i got here to go back the prefer?.I am trying to find things to enhance my website!I assume its adequate to use a few of your concepts!! I just like the helpful info you supply to your articles. I will bookmark your weblog and take a look at again here frequently. I am reasonably sure I'll be informed plenty of new stuff right here! Best of luck for the following! Someone essentially lend a hand to make seriously posts I would state. This is the first time I frequented your website page and so far? I amazed with the research you made to make this particular post incredible. Excellent process! hello!,I really like your writing so a lot! share we communicate more about your article on AOL? I need an expert in this area to unravel my problem. Maybe that is you! Taking a look ahead to see you. I'm no longer sure the place you are getting your information, however good topic. I needs to spend a while learning much more or figuring out more. Thanks for fantastic information I was on the lookout for this information for my mission. Pretty section of content. I simply stumbled upon your weblog and in accession capital to claim that I get actually enjoyed account your blog posts. Anyway I will be subscribing for your feeds and even I achievement you get admission to persistently fast. A whole new internet phenomenon features sprung up these types of previous a couple of years. Free of charge charitable organisation game web sites pledge to donate to numerous brings about if the guest is just ready to play an internet online game. http://vimeo.com/30752740 great kids video for halloween goes perfectly with the theme. What does this have to do with rocket propelled grenades? Just keep them away from the online variety of RPG, which aren't really RPG's at all, but addictive, soul-sucking wastes of life. Did WoW steal your spouse? maybe some spell check at times? prg? Holy cow! A mainstream article praising RPGs? I never thought I'd see the day when RPGs weren't being demonized in the press. Magic the Gathering (a card RPG) was my first foray into these games. I'm 36 now and my 9yo son is a Magic whiz. I credit the game with helping him develop his math and reading skills to the point that his lexile range is over 1200, he is in gifted-and-talented for both ELA and math, and makes straight As. ROCKET PROPELLED GRINADES are good for kids...you guys didnt know it so far. pitty u.
RPGs are incredibly beneficial to anyone who writes, draws, directs film, or acts. If you have an imagination, you would be remiss to pass up an opportunity to play in a game. There is no movie, no book, no video game more vivid and captivating than your own imagination, in which you help create a world and characters of your own design. You don't have to be a super nerd to reap the benefits of a RPG. 'RPG' has been an accepted abbreviation basically since the 70s and 80s to refer to these types of games (like D&D, oh noes not another abbreviation!!). That is well before Twitter came around. Try to relax, take a deep breath, and not use an unrelated subject like RPGs as an excuse to rant about the state of the world. Thanks. "RPG" as an abbreviation has been around since I was born in 1983, where the hell have you been?? Grumpy old dude or what? I read this headline and immediately went out and purchased my child a rocket launcher. I want CNN to pay for my house repairs. RIght on, Jim, I've never understood what CIA, FBI, USA, CBS, NFL, or GE stood for, either. So I am supposed to understand what "NC" means? Seriously man, are you really mad that you did not know what RPG meant? You clicked it, and know you know. Why does learning make you mad? RPG is explained in the very first line of the article, allowing the writer to use "RPG" for the rest of the article without spelling it out. My daughter plays Toontown online (toontown.com) and just loves it. She is 12. It's like a game and a social environment all in one where she can meet her friends. It is made by Disney and is very wholesome and safe. HA! When I was a pup, and D&D was the latest of Satan's attempts to pervert the morals of impressionable young nerds, I caught more flack for my 20sided dice than the hoods did for their hand rolled herbal cigarettes. HA! Take THAT Principal Stephens! HA! TAKE THAT! Rev. Doughton! And for all those people that still think people that play RPG's are part of some satanic and evil cult- I have news for you. We're running your National Security! RPG's are running our national security? Now I am scared. Could it be you have failed at conveying your point through poor English / writing skills? Hipsters are not cool. Period. They steal the hobbies of us math/science nerds, and then pretend like they invented it. They call the Marvel X-men and Marvel Alliance games RPG's as well just because you can dcdeie how to spend point on your character to improve them. I don't conscider them to be RPG's however, its an action game with one function to improve your stats. There are very few occaisions where your decisions impact the game, theres walk in a straight line and beat up punks, unlock a door and beat a boss then move to the next stage. Repeat and wash. To me an RPG has an evolving storyline, a leveling system based on earning experience, and character interaction (my favorite being group based character interaction.). As for why I didnt buy Fable III, I bought Fable 2 and after several days worth of gaming I got stuck in the colluseum with an unkillable beatle. There was no way to get out of the colliseum and I essentially lost my character because a glaring bug was left in the game and Lionsgate studios never made the effort to fix the problem. I forsaw that thier shoddy programing and customer service would probably be just as bad in 3 as 2. I have heard a lot of people are disapointed with all the obvious bugs that should of been fixed before it was released. Some great conversation going on here guys, thanks for the nice words. But wow, that I "consider myself a col hipster who doesn't know anything about video games" is just wrong. I play video games, I own the major consoles, and my kids have a WII. I have nothing against videogames, except that I don't want my six year old in front of the set playing them just yet. There's plenty of time for that later in life. And yeah, I do have a job. As the author of those best-selling Dungeons & Dragons Rolegame rules of the 1980s, I had to drop by and say thanks. The basic principles have always been about social entertainment, providing common interests encouraging parents and kids to easily interact. Game on! You are NOT "the author of those best-selling Dungeons & Dragons Rolegame rules of the 1980s," – that honor goes to Gary Gygax. You edited J. Eric Holmes and Tom Moldvay's work at Gary's behest. All MY AD&D (and Basic D&D) books say "Gary Gygax" "David Cook" or "Tom Moldvay" on the cover. Looks like The Iron DM forgot to check the credits on the Companion, Master, and Immortal boxed sets. Thanks to Mr. Mentzer for his many contributions to our beloved game! I found it extremely surprising and amusing the number of people who didn't know at first that RPG had more than one meaning. Amusing that so many people live their lives in the real world? What is going through the minds of adults who play farmville, rather than live in the real world? Thank goodness! I thought he meant Rocket Propelled Grenades. Gotta work on the acronyms here. To me, and many veterans, "RPG" means "Rocket Propelled Grenade" which I generally discourage my kids from playing with. Somehow I suspect that someone in Afghanistan or elsewhere in the Middle East is running this through Google Translate right now because he thinks it means Rocket Propelled Grenade! How disappointed he will be. And the real weird stuff happens when you start playing futuristic role playing games such as "Traveler" which have various types of rocket propelled high explosives. I am so glad that both of my parents were RPG players in college, and encouraged me and my siblings to play. It does encourage imagination, helps with math, and with reading. As well as stratagy and allu ows you to make friends and be involved in something that has actual people! There are so many RPGs out there that are geared to younger kids, and as you get older, the more advance they become. Personally I prefer the cards...Magic wlll alway be my favorite pass time...and I started playing that shortly after it was introduced. In my parents case it was D&D. (chuckles) Reading, but what about writing? Pick up the Pathfinder RPG by Paizo. I think DragonQueen hit it right on the head. I have read all the reply's thus far and hers (a female, I uassme) is the most sound. Blackthunder01 has been defending the video game rpg's (and a great defense at that), and according to Wiki, every game that was talked about here can be considered an RPG . Wiki states that RPG's are a broad family of games . Some of us agree with that, and some of us, like Rodrigo (and myself) don't agree with that. My reasoning is very simple. In a Pen and Paper RPG I can choose every bit of detail that goes into my character, and I can choose how I want to interact with the world (that was made by a DM). If I create a Character who is out to destroy orcs and in turn hates half-orcs, I can choose wether or not to be mean to any and all half-orcs that I meet. And if I feel that my character would do something, no matter what it is, I can do it. Computer style RPG's can not give me that. In DnD and other PAP games you can (try) to do absolutely anything, as long as it is a reasonable thing that your character would do. And that is assuming that your being a, what I would call strict player.As for the DM, there is no way that A DM can pre-generate every single interaction, and the reason being is because he has no idea what the characters are going to do. yes a DM can choose to break or not break a rule, but a Computer certainly cannot. And if it seems that it can, it has a rule for why it decided to break that rule. Thought RPG meant Rocket-Propelled Grenades. My bad. My daughter plays the RPGs of the article a lot, and does sports, and writes a lot, and does well academically. Mr. Bertran seems to be onto something here. I let my kid play with IEDs to help with his development – Intelligent Electronic Devices. Nope, happily married with 3 adult kids & 3 wonderful grandkids. Bless my incredible husband, he doesn't mind if I get wrapped up & spend 4 hours sitting there playing Morrowind or Oblivion (although he does gently remind me I need to eat!). Impatiently waiting for Skyrim to come out in November... it looks like it will be as great as the others in the series. I was hooked after my dad bought me D&D from a hobby shop where he was shopping for model trains. Been hooked ever since. My 7 year olds first book he had me read was monster manual ver 3.5. NWN2 is still a good game to play with all the mods and online worlds. I Just download a Game, that is RPG! But now I am doing what my friends did which did writting stuff down on the game well you playing it. It's good to keep Note's and yeah! I which RPG Games well get popular sooner or later I just wonder If I can make a very good RPG Games because I love it i love the stuff going arounding the characters and they have use there Brains to solved them . Also that Dragon Wife 1 I agreed with you , also that I understand that some kids today don't like it ! I just Mad when I playing RP On my Chat room they don't like it at all !.. ); Uhh.. just which that there is more 3ds games that are Role Players and let them created the charater but they have to fellow along with the story. RPG's are great for kids. Every parent should want their kid to know how to use advanced weaponry. Am I the only one who thought they were referring to rocket propelled grenades? That would have made for a more interesting article. No. What is scary, is that so many people did not. Yikes! I practically teethed on RPGs. I think they're great. They make you think and strategize. In the case of older video games, you were reading an interactive story. The reading element has largely been taken out, but you still have a much more mentally stimulating game than a first person shooter. D&D has a bad overall reputation, but not all tabletop RPGs are D&D. If you don't want your kids to be playing warlocks and elves, there are plenty of other tabletop RPGs available that are not magic based. And you can always, easily, make your own. All you have to do is be creative. When you're used to rpg gaming, that isn't hard. The genre really isn't that important, the primary skill kids will carry away from an RPG is the ability to imagine being in the other guy's shoes. Understanding leads to empathy, and being able to see outcomes where everybody wins will make for great citizens. One of the advantages of D&D: Before the advent of D&D when would a group of 10 year olds sit around a table and discuss and even argue the philosophical differences between chaotic good and lawful good. And especially who one's actions should be governed accordingly. Pretty heavy stuff for 10 year olds. "Well, rpg's are more imagination driven, more social, and again, I can't say enough about the math and reading progress my daughter made as we played together. Video games are mostly about sitting on the couch mashing buttons, and that's not something I want my kids doing yet"
Yes, and video game RPGs are immersive, just as often social, and require a LOT more reading (menus, rules, and tutorials are WRITTEN), and generally involve a fair bit of math (min/max'ing, upgrading gear, earning gold, buying items). You can also play them (gasp) with your daughter. This guy doesn't have a clue about video games. Stopped reading after determining that he considers himself a cool hipster for playing games with dice and a board rather than with a controller. Get over yourself, dude. I'm definitely a video gamer, not tabletop, but I think there are more advantages to kids development playing tabletop games. Thats not to say that video game RPGs can't be good as well. First, the abstract nature of tabletop RPGs provides much more stimulation for a kid's imagination. In video games everything is drawn out for you, while in a tabletop game you have to imagine the environment, your character, and the monsters (similar to the difference between books and movies in that regard). Also, there is a ton more math involved in tabletop RPGs. Video games do most of the math for you, and the math you talk about go way over a child's head (is your kid really going to be min/maxing?). I'm interested in what video games you play, because I play both- and across the board, RPGs in my experience have required more reading. I'm not busting your chops or anything, I'm just not seeing the evidence. Aaaaand Clint is a moron. I agree. Video games in general are entertainment, no one disagrees there. But MANY of them include mind-challenging elements like solving puzzles, teamwork in co-op modes, mental map-building and memory, and reading and listening comprehension as the story unfolds. Video games are much more sophisticated now than the days of PacMan and Donkey Kong. These days they're essentially interactive movies. I'm not saying that kids should be encouraged to play video games because they teach life skills, because that would be a bit much. But video games aren't necessarily empty entertainment, for either kids or adults. These days the game developer community is also quite interested in making games that parents and kids can play together. For example: Portal 2. The co-op mode was intentionally designed with the notion that a parent might want to play alongside their child, and not just two kids or two adults playing together. Playing games together can be a real family bonding experience... and as it happens, the strongest observed correlation of this is when dads play games with their daughters. RPGs brought the father who wrote this article a fantastic opportunity to share a common interest with his own daughter, so it seems true for the author! There is no video game that is a true RPG. The computer can only come up with something that has been programmed into it. If you, as a player, want to go off and explore part of the landscape that is not part of the plot, there is no way to do so. This is where the face to face, tabletop RPG excels. You, and your fellow players, can take the adventure in a totally different direction at any time and play off input from each other. There is no video game that allows such freedom of action. You can maneuver a character thru various obstacle courses in video games, but you can't role play the character. Give me the social interaction and creativity of tabletop gaming any time. What about interactive web sites where the participants CREATE the RPG while playing it? The only limits there are their combined imagination. I have to agree that video games, while they can use lateral thinking (if programmed for it), develop social skills (for multi player games), etc, what they can't really teach is thinking outside of the box. In my experience, people are very happy in their safe box and anything outside of it is scary. The rules are the rules, don't dare to be different, don't think different, don't make exceptions. For a large part, video games are in the box because there's pre-defined reactions for your decision. If it wasn't coded, you generally can't do it. However, with a table top game, the sky is the limit. I can remember a con game I played a few years back where I was a caster and casting ANY magic took a ritual. Werewolves were after me, I didn't have 5 minutes to light a candle and chant, but I did have a canteen and wolvesbane on me. I put the wolvesbane in the canteen, shook it while I ran, then turned around and maced the beasties. The GM was rather stunned because nobody had thought of that in his play tests. The same happens to me every other Sunday when my friends gather for my Darkage Vampire game. I will plan something, I have an expected outcome, and bam...they do something completely and totally off the wall that I couldn't even have thought of. Lateral thinking at it's best! I've always felt is was necessary for my kids to play with RPGs, in fact, I taught them how to make RPGs out of old coffee cans. But I highly recommend you refrain from teaching the kiddies about IUDs until they are in their early teens. I've played RPGs since my grade school days (as far back as 1st edition AD&D). I think that there's something missing in this discussion. Math is an essential element in almost every RPG that I've seen. You take damage, you subtract hit points. You have a critical hit? Multiply that damage. Not to mention that the randomness inherent in dice rolling is one of the only places anyone gets any practical experience with the mathematics of probability. RPGs make mathematics into a game, and this is one of the best ways to get people interested in learning. Oh, yeah, and there's a ton of other things that you learn, like mythology, social interaction, a good bit of real world history, and reading skills. kids are now playing with "Rocket Propelled Grenades"?????? ....we used to play war but it would be so much more fun with live ammo !!!! My husband has been devising 1e D&D compaigns for our oldest daughter for years now – the little one should be ready for it soon, too. It's a GREAT way to spend time with your kids, fire their imaginations, and teach people skills like cooperation, teamwork, etc. Contrary to popular belief, nerds and geeks have people skills – they have to in order to play these games! 🙂 Going to share this story with the hubby and maybe check out the game, but I'm sure he'll stick with the home-grown campaigns. Why must people mock those who are finding enjoyment in life...something simple and even interactive. Doesn't matter who is on the end. They're not hurting you or breaking laws, let their decisions be their own. Get off Welfare and get a job. My taxes shouldn't be used to fuel your level 7 orc in your mom's basement. tea Party Express- I'd be willing to wager that the producers of said games make a heck of a lot more than you do; as do the comic book artists who tour to showcase their work and have a regular gig with a publisher. Or the staff writers who craft MMO adventures. You've obviously got a mindset that's quite backward. There are some gamers (both video and tabletop) who are the stereotype. Just like there are some tea Partiers who do as well (you know, the back home 'good ole boy' 'git 'r done' mentality). However, there are a lot that would surprise you. I know of investors, corporate VPs, actors/actresses, musicians, and the like who all get into MMOs and gaming in general. I'd love to see you call Vin Diesel a basement dwelling troll for his love of D&D, for example. Before you try to turn on me: I work for an insurance company, am a psychology student, part-time writer, occasional freelance comic artist, and yes, I enjoy video games, MMOs, and tabletop RPGs. Oh, and comics, as well. Who says he doesn't have a job? And it sounds a lot like you are working on levelling up your troll. with +2 skill proficiencies in slander and libel to boot! Your taxes don't pay for the mostly under 18 crowd that plays RPG's. I have played MMORPG's for several years and the majority of older players I have met have been parents who play after their kids go to bed. Unlike you who probably sits in front of the TV doing nothing. Subract the younger crowd, college students and parents, the majority of those I have met have regular full time jobs, myself included and are contributing members of society. Your stigma of something that isn't farmiliar to you or intriging to be bad not only for those do play, but to you as well through some diluted sense of reason, is outrageous. Who gives free stuff to guys online? @TeaPartyExpress Um, the guy DOES have a job. He's a producer for a major television network. If you don't have anything constructive to say, maybe you should go join the Occupy Wall St. movement instead. hey tea party guy/girl- R U GAY?